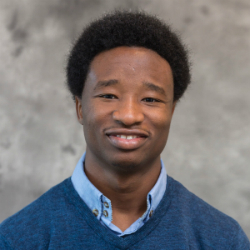 From a young age, Joseph Vandy Sengeh had an unwavering passion for helping others. He witnessed the dire conditions of Kpetema Village in Sierra Leone every time he visited for holidays. Lack of basic toilets prompted poor sanitation and hygiene, and villagers struggled to maintain thatch roofs on their homes, which lead to poor living conditions and health issues once the heavy rains rolled in. Joseph knew he could make a difference. At 17 years old, he used his savings to help residents of Kpetema Village construct their first latrine. Then, through a $10,000 grant from the Davis Project for Peace, he provided further improvements to the village. He helped build two pit latrines, fortify roofs with zinc panels, renovate a hand pump, start soap production in the village to maintain cleanliness, and conduct an event to educate the community about health and safety. In addition to meeting basic needs with these projects, Joseph also brought the people of his village closer together. They strengthened their ties with each other and recognized that by uniting as a force, they could accomplish anything. Joseph’s future projects include starting the first commercial farm in Kpetema Village, promoting sustainable farming, training women of the village to use the new technologies to continue growing and processing food crops, and encouraging women to stand up for their rights in the village.